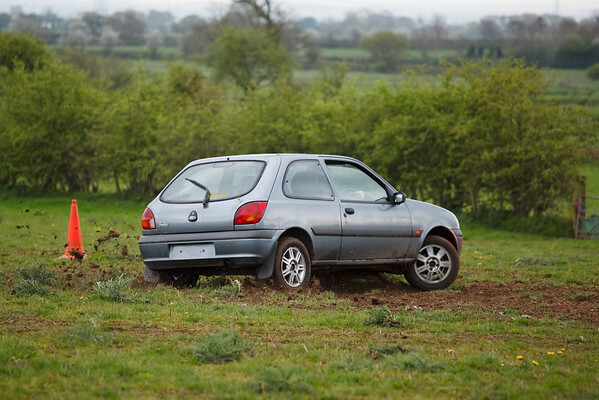 The second grass Autotest ran mid-June but this report wasn’t written for the newsletter copy deadline the week after so for those of you can remember back, this is how it unfolded. Fourteen competitors arrived at the freshly silaged grass field at Longpark. Setting out the new layouts a test of routes to be used at the display the club were doing at the Cumbria Auto Show the week later…turned out to it never ran as dust prevented the display happening. However, test one of the new tests was one that no one had ever ran so this event was a leveller. Helen Harkness was fastest with 1m06 just ahead of Nigel Harkness on 1m07. Geoffrey Harkness and Barry Lindsay getting 1m09. Running new tests always produces wrong tests, Phil Hodgson, Andrew, Geoffrey, Mike, Sade & Lizzy Burke and Josh Shaw. 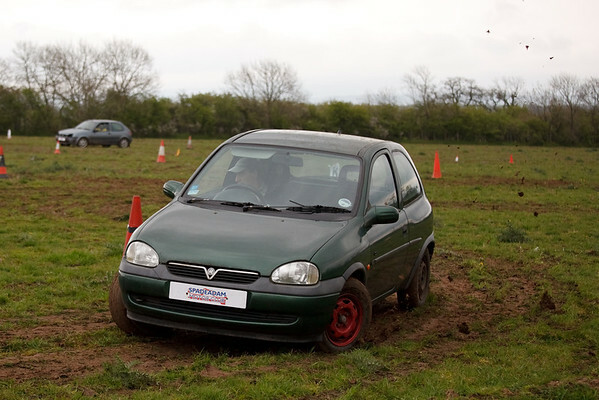 The Summer grass Autotest saw 12 drivers battle it out over 10 tests, it had been planned to run 12 but the weather turned so bad there was no fun for everyone standing around. For the first time we had a BBQ after 6 tests to try and attract non competitors along also. The field was dry for the majority of the tests. Test 1 Nigel Harkness & Barry Lindsay equaled on 1m27, Andrew Graham on 1m28 then Helen on 1m30. For the re-­‐run Nigel was quickest on 1m24, John Ross got 1m26 then Barry on 1m27 again the Geoffrey Harkness on 1m28 in roadcar class Fiesta. 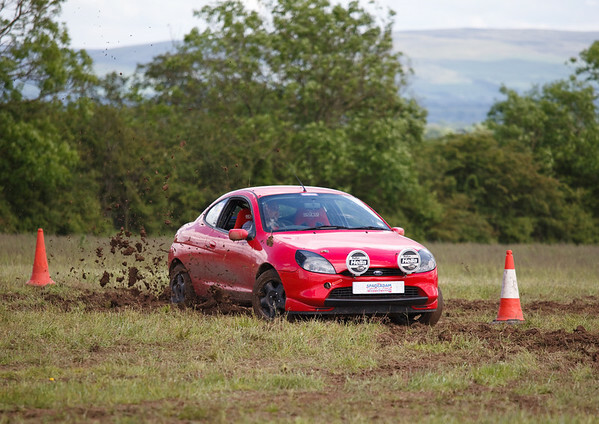 Due to weather and lack of entries cancelling the others The Summer Grass Autotest at The Plump Nr Gretna was the first Autotest of the year. Eight competitors turned up on a Sunny Sunday afternoon for an action packed 12 tests. The test was using a grass field which had been silage a few days earlier so was it excellent condition. Test 1. Nigel Harkness was quickest with 1m07 just ahead of Helen Gibbon with 1m08, Barry Lindsay on 1m10 then Kenton Pattison & Andrew Graham on 1m10. Test 2. Was a re run. Barry quickest with 1m05 just ahead of Helen on 1m06, Nigel on 1m08 and Andrew on 1m09. Test 3. We moved area slightly to avoid cutting up the ground. Kenton was quickest with 52 ahead of Barry on 53 then Helen & Andrew both on 55. Test 4 was a re-run Nigel, Helen & Andrew were quickest all on 53, John Barber got 54 on his first Autotest and had soon got the hang of it. Test 5 was a new route and a bit more complicated, Barry getting 1m04 but was fighting back after a previous cone. Kenton got 1m05 but he also had be getting cone penalties. Helen got 1m08 and was leading the event tactically mixing precision and speed (Yep, that was exactly what I was doing…errrr…!! – Helen). The summer Grass tests were ran at Longpark in June. Despite rain on the Saturday afternoon it had dried enough to run on the Sunday afternoon. Ian Robinson & Michael Lindsay were the timekeepers for the afternoon while Caroline Lodge worked on the results. 12 tests were run with the final two being a head to head special test. First test Barry Lindsay was quickest with 53sec only just ahead of Andrew Graham on 54sec then Landowner Joe Thomlinson on 56sec, visitor Jonny Crisp a junior from the North East brought his KA over and got 58sec. John Ross got off to a bad start getting a wrong test. On the rerun Barry got 54sec as conditions dug up a little, Andrew got 56sec along with Geoffrey Harkness. Jonny & Nigel Harkness got 57sec. At the end of April it was thought that ground would be hard…well it wasn’t! But the event went ahead with some tricky conditions and would reward those with a feel of grip through there right foot. Ian Robinson had designed some new routes for the event and set the event off marshalling tests 1&3 while Barry Lindsay ran 2&4 at the same time. Geoffrey Harkness was fastest on the first test with 1m 06. Nigel Harkness was next on 1m 14 then Andrew Graham & Kieron Stynes on 1m17. John Ross, George Carrick & Alex Beaty all wrong tested. Test 2 Neil Thomlinson was quickest on 54sec ahead of Nigel on 55sec, Richard Clark with 57sec then Kenton Pattison, Andrew & John on 58sec. The June Autotest was held at Longpark in a different field, the field had been unused since finishing combining last autumn. The surprise on faces as people saw the field. The wild growing grass in places would be almost knee height. Two test sites were set out and with a good entry of 16 competitors and we were pleased to see new faces. 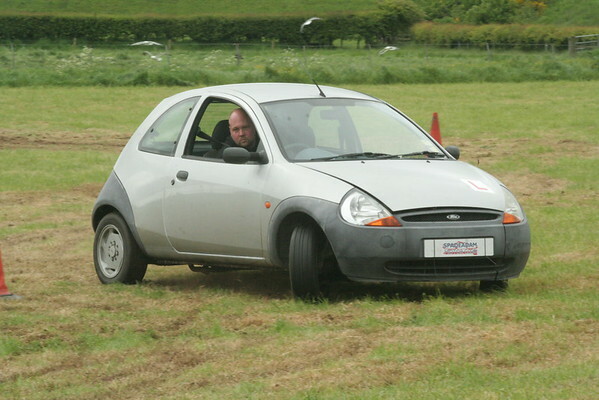 The second round of the Autotest championship was held at Longpark Farm for the first of our grass tests. Ian Robinson was running the tests and had 10 new routes. First & third tests were marshalled by Michael Lindsay. Geoffrey was quickest with 38 sec, followed by Barry & Richard on 40 sec then Neil T & John S on 41 sec. On the re-run Richard, John S & Barry were tied on 38 sec, George & John R got 40 sec.